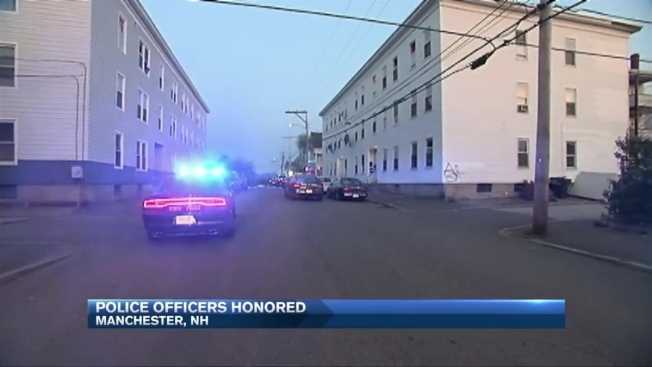 Police officers in Manchester, New Hampshire, were recognized for their bravery on Monday. Manchester Police Chief says he's thankful he can recognize his officers and still have them on the job. Officers Ryan Hardy and Matt O'Connor were among those awarded the Medal of Valor for their bravery and professionalism. Back on May 13, police say 32-year-old Ian MacPherson of Manchester shot Hardy in the face and shoulder when he tried to stop him in the street. Hardy managed to radio that he was shot and gave a description. Officer O'Connor encountered MacPherson not long after and was shot in the leg allegedly by the suspect. MacPherson was arrested three hours later and charged with two counts of attempted murder. Nearly three dozen other officers and dispatchers received awards for their heroism on Monday, many who were part of that day. Both Hardy and O'Connor have returned to the job on the midnight shift since August.